For a quick overview of the new functionality, you can keep reading this blog, or if you want a video overview, check out our team member Allison’s introduction to Visual Studio 2019. But before you do either, make sure to kick off the download. Right off the bat, you’ll notice that Visual Studio 2019 opens with a new start window on launch. This experience is better designed to work with today’s Git repositories – whether local repos or online Git repos on GitHub, Azure Repos, or elsewhere. Of course, you can still open an existing project or solution or create a new one. (This experience is also coming soon to Visual Studio 2019 for Mac.) We’ll have a more detailed blog post on the new start window experience next week, which will also go into some of the research that supported this revamp. Once you’re in the IDE, you’ll notice a few changes to the UI and UX of Visual Studio 2019. Jamie Young recently published a blog post with more detail on these changes, but to recap, they include a new product icon, a refreshed blue theme with small changes across the UI to create a cleaner interface, and a more compact title and menu bar – for which we’ve heard your feedback loud and clear and are working to further optimize. In addition to the enhancements Jamie mentions, today we’re sharing the new search experience in Visual Studio 2019, which replaces the existing “Quick Launch” box. You can now search for settings, commands, and install options. The new search experience is also smarter, as it supports fuzzy string searching to help find what you are looking for even when misspelled. When you’re coding, Visual Studio 2019 makes it easier to get your work done quickly. We’ve started by focusing on code maintainability and consistency experiences in this preview. We’ve added new refactoring capabilities – such as changing for-loops to LINQ queries and converting tuples to named-structs – to make it even easier to keep your code in good shape. With the new document health indicator and code clean-up functionality, you can now easily identify and fix warnings and suggestions with the click of a button. Common debugging task are also easier. You’ll immediately see that stepping performance is improved, allowing for a much smoother debugging experience. We’ve also added search capabilities to the Autos, Locals, and Watch windows helping you track down objects and values. 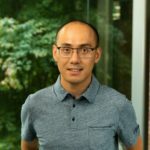 Watch for a future blog post that goes deeper into the debugger improvements in Visual Studio 2019, including the new Time Travel Debugging for managed code feature (coming to a future Preview), updates to the Snapshot Debugger to target Azure Kubernetes Service (AKS) and Virtual Machine Scale Sets (VMSS), and better performance when debugging large C++ projects; thanks to an out-of-process 64-bit debugger. Building on the work we started in Visual Studio 2017, we’re improving Visual Studio IntelliCode, our context-aware and AI-powered IntelliSense, to enable training it on your own code repositories and share the results with your team. IntelliCode reduces the number of keystrokes you need since the completion lists are prioritized on the most common coding patterns for that API combined with the context of the code in your existing project. We’ll have a blog post on all the improvements in IntelliCode coming later this week, including more details on learning from your code, and C++ and XAML support being added for Visual Studio 2019. Earlier this year, we introduced Visual Studio Live Share to help you collaborate in real-time with anyone across the globe using Visual Studio or Visual Studio Code. Live Share is installed by default with Visual Studio 2019, so you can immediately invite your teammates to join your coding session to take care of a bug or help make a quick change. You’ll also find it’s easier to start a session and view who you’re working within a dedicated space at the top-right of the user interface. We’ll also have a deeper-dive post on Visual Studio Live Share improvements in the next few days, including support for any project, app type, and language, Solution View for guests, and support for more collaboration scenarios. Last, we’re introducing a brand-new pull request (PR) experience in Visual Studio 2019, which enables you to review, run, and even debug pull requests from your team without leaving the IDE. We support code in Azure Repos today but are going to expand to support GitHub and improve the overall experience. To get started, you can download the Pull Requests for Visual Studio extension from the Visual Studio Marketplace. We also announced .NET Core 3 Preview 1 today, and Visual Studio 2019 will be the release to support building .NET Core 3 applications for any platform. Of course, we also continue to support and improve cross-platform C++ development, as well as .NET mobile development for iOS and Android with Xamarin. We are very thankful to have such an active community and can’t wait to hear what you think about Visual Studio 2019. Please help us make this the best Visual Studio yet by letting us know of any issues you run into by using the Report a Problem tool in Visual Studio. You can also head over to the Visual Studio Developer Community to track your issue or, even better, suggest a feature, ask questions, and find answers from others. We will share more about the full feature set and SKU lineup of Visual Studio 2019 in the coming months as we release more previews. 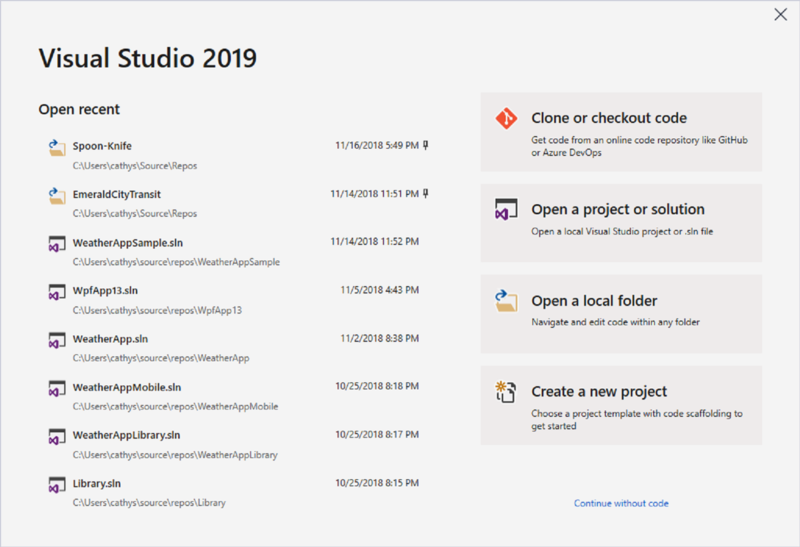 You can try Visual Studio 2019 side-by-side with your current installation of Visual Studio 2017, or if you want to give it a spin without installing it, check out the Visual Studio images on Azure. I also want to take a moment to thank our vibrant extension ecosystem, who have made over 400 extensions available for Visual Studio 2019 Preview 1 already, and more are being added each day. You can find these extensions on the Visual Studio Marketplace. Microsoft has always been a company with developers at the heart – we’re humbled that the community of users of the Visual Studio family has surpassed 12 million. We aim to make every second you spend coding more productive and delightful. Please continue to share your feedback on the preview for Visual Studio 2019 to help guide the future direction of the product so it becomes your favorite tool. Thank you!